Irreverent, hysterical, saying out loud what most of us only think. I’d tune in late at night as a teen, and listen to these bad boys of radio, wondering what it would be like to work with them. Years later, I found out. These disc jockeys were just as crazy in person as they were on air. 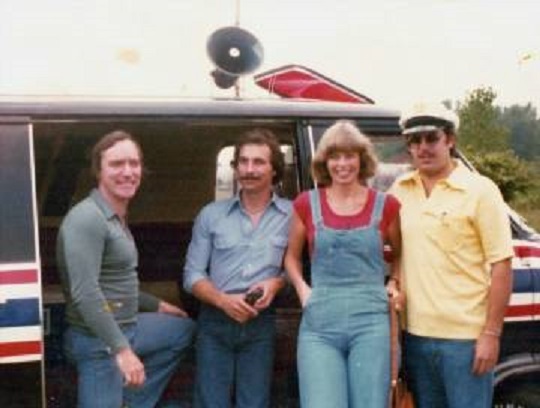 Radio news director Ron Bee was one-half of the morning team, Rick and Ron, at WOLF-AM radio – a popular Top 40 rock ‘n’ roll station in Syracuse, New York. I was still in community college when he hired me to do an early-morning on-air Sunday news shift. This was a time when most good little rock ‘n’ rollers were safely asleep in bed. Unfortunately, the general manager was not. I had never broadcast live before. At best, my delivery was shaky. My career was almost over before it began. Ron lobbied for me to stay on to do one of the taped public-affairs programs. His confidence in me spurred me on. I couldn’t match his booming, on-air delivery. But I learned a lot from his writing, his humor and his patience. One lesson was to really “listen” during an interview. The subjects ranged from Bill Kaysing, considered to be the father of the moon hoax, who wrote the book, “We Never Went to the Moon,” to more controversial subjects like nuclear power. After co-worker Sandi Tams Mulconry and I taped our separate interviews – the pro and con on the subject – in the studio, I sat there pleased with myself. I had done my homework. But, to my chagrin, when I listened back, I found the interviewees had neatly tap-danced around the situation. They never answered the question. Also, I should take my own advice. One night, as snow pummeled the area, I was advising listeners to get off the road and stay home. The irony wasn’t lost on me. Minutes later, I headed for my car. I got stuck in a snow bank before I even left the station’s driveway. Passing motorists stopped to push me out. Closer to home, I got stuck again. Again, someone stopped to help. That commute – typically 10 minutes – turned into a two-hour ordeal before I got home. But I made it in time to make our daughter tacos for her 6th birthday and to celebrate her big day. The hours were long. But, hey, I got to interview folk singer Richie Havens, golfer Arnie Palmer, former Secretary of State Henry Kissinger, and met some of the pop singers of the day. Heady stuff. Another bonus? Being accepted by the merry pranksters at the station. Sure, I was a target for their pranks. But it was all in fun. I’d look out from the news department and see that DJ Charlie Brown was talking to me from his on-air booth. I’d frantically turn the dials, trying to open up the sound to hear him. When he started laughing, I realized he had been lip-synching. I’d been had. OK, game on, my friend. Listeners at home had no idea what was going on. When I broke out laughing during a newscast, you can bet there was mischief afoot. But their gags were mild compared with some stunts that I’ve heard were pulled elsewhere. It was high school all over again, and it was a lot of fun. There are many I worked with at WOLF that I’d like to thank for their support and guidance. I couldn’t have made it thru that first year without: Ron Bee, Rick Gary, the late Jim Sims, Peter King, Carol St. John, Sandi Tams Mulconry, John Gabriel and Rick Charles. I apologize if I’ve left anyone out. I had not one clue that you were a member of the Syracuse radio crew, Judy. 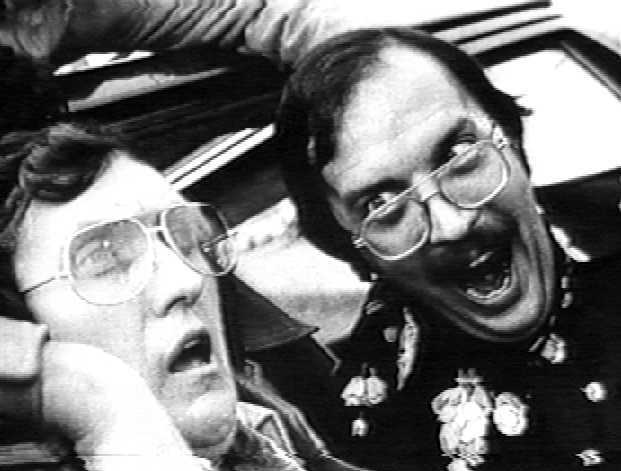 I love the shot of you interviewing the late Mr. Havens. Radio is fun. I dabbled. A decade ago I did a “job trade” stunt with Mimi Griswold of TK99 and hosted her Sunday morning “Blue Moon Cafe” show. Once I got over my which-button-to-push fear, I loved it. By the way, some of the names you mention are true hall-of-famers. Lovely memories to share. Thank you. What a great post, Judy, and the pictures are wonderful! Now I know one of the reasons you’re such a good writer: you learned early on that many ‘tap dance’ around the issues and avoid the real questions. You, my dear, do not avoid anything. Excellent! Thanks, Marilyn. There are times when I’m a vegematic. But I try to “really” listen when people tell their story. What an interesting life you’ve been living, Judy. I’m interested in whether you listen to radio much today, and if you do, which broadcasts do you like? I find that most interviewees today totally tap-dance around the questions, never answering them, and a whole lot of interviewers let them get by with it. That bugs me. I am a radio news junkie. I listen to NPR – Morning Edition, All Things Considered, and “This American Life.” My music tastes? I listen to The Mike Harvey Show on WSBH-FM (98.5) – classic hits and oldies; and to The John Tesh Radio Show – Lite Rock (99.3) on WLRQ-FM. I also listen to jazz. About interviewing, what I suspect happens – based on my own experience – is that the interviewer is so focused on not having dead air that they just move on to the next question. (Sometimes dead air is not a bad thing. It can motivate the interviewee to open up.) The interviewer isn’t listening and, as a result, s/he doesn’t do a logical follow-up question. I often listen to radio interviews on one of our local stations, and it’s apparent that the interviewer is reading from a prepared list of questions. She never deviates, no matter how the previous question was answered. I’m sure you were much better — and just as much fun to work with as all those more experienced pros. I learned the hard way, Charles. I got better because of the support of the more experienced pros that I worked with. And, yes, I’d like to think I was “just as much fun to work with.” Thank you for the vote of confidence. As I told Tracy Lee Karner above, that lack of follow up to a question might be the result of the interviewer just trying to avoid dead air. When the interview is live on-air, that could especially be true.The pressure can be intense. I love reading about your radio days, it’s fascinating. I bet you were great and hilarious from the get-go. And those pictures! I’m impressed. Thanks, Darla. I was privileged to meet some of the greats. Glad you liked the pics. The one of Captain and Tennille made me sad. They split up this year and I remember when our girls got to meet them in the lobby of WOLF. They were about 6 and 4 at the time. Both singers were really sweet and gracious. Though having never had the good fortune of having worked as part of an energy laced, creative 24X7 outfit like a Radio or a TV outfit, my experience of intensely creative folks in other areas has been that they are non-conformists and at times loners. Could this be because their inner ‘cogs and wheels’ move along such different pathways that, experience has taught them, not to be open about their thought-out possibilities lest they be construed as off their rockers. Their ‘learnt’ behaviour pattern is thus to maintain a semblance of external conformity to gain acceptance. Would you agree to this? Great insights. While not as wild and crazy as some I’ve worked with, I also fall into this category. In many ways, I am a nonconformist and, at times, I am a loner. But I do enjoy other people’s company. Thank you. I’m glad you enjoyed my story. Thanks for the laughs tonight, fantastic post. And dead air, a radio personalities worst nightmare. Or being told it’s your turn to climb the tower to do maintenance. That was a very interesting piece of your life Judy! 🙂 I can imagine it must be very difficult to interview some celebrities, because for one reason or another they don’t want to give a straight answer. Politicians I would have thought would be the worst for tap dancing round the question – am I right, or are their worse offenders of never giving a straight answer than the politician? Listening is something we all think we do, but often we don’t as much as we believe we do, I guess those interviews must have really trained you to listen intently! I remember a doctor doing a very big tap dance for me when I questioned him over why my mother was so heavily sedated when she was ill in hospital – it wasn’t a benefit to her at all. He agreed to change her medication, but basically juggled a whole load of drug names around making it sound like it was a change for the better, when in fact she was going to be no less drugged up and sedated than before. I was listening, and I made him really mad when I explained how he had just told me that nothing was going to change all – he was silently fuming with me! I think doctors can sometimes be as bad as politicians! 😦 It always pays to listen carefully in all areas of life. Politicians would top my list for most evasive answers to a direct question. Suzy, people always seemed to confide in me a lot. I think that was because I was a good listener. But I think those skills were enhanced after I became a reporter. 😉 It’s a good thing for your mum that you are a good listener. Otherwise, she might have had a serious setback with all that medication. Good catch. It was great to read about your radio adventures! I find that I enjoy listening to radio programs more and more. It’s nice to give my eyes a break sometimes and rely on my ears! Thanks, Lisa. I also love to listen to the radio use my imagination to determine what the characters and setting looks like. You’re right it’s a welcome break. Oh, wow. That is so cool my friend. A very exciting post. Wow! What a superb post, my friend! A delightful read, and, as mentioned by all, great pix that doubled as tix for a wonderful ride in a time machine!! Quite a revelation. I knew you’d worked in both newspapers and radio, but I hadn’t thought much about the latter. Richie Havens, Arnold Palmer, Henry Kissinger– whoa! some pretty heavy hitters back in the day. Sounds like quite a gig!! Loved that picture of you and Havens, and especially enjoyed the part about how Mr. Bee kept telling the general manager, “C’mon, give the kid another chance– I got a feeling about her, boss! !” Well, clearly he was right! Glad you liked this, Mark. 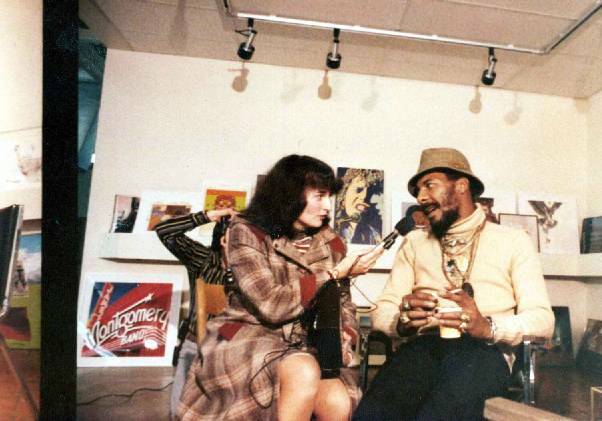 With Richie Havens, it was a sit down, one-on-one interview. With some of the others, it was either a brief news conference before they went into speak … or, with Liza Minnelli, it was a good-paced walk down the airport terminal as I held my microphone to get her comments. All of them were really gracious and very nice. It was a blast!